Are you planning a visit to Bologna and would like to know what places you should visit? Or, you have looked at the tourist guides, but you would like some thing more? Often people coming to Bologna ask my advice. Naturally my advice depends upon my interests. When I visit a place, I like understanding about local history, and arts. I also like visiting any sites of archeological interest. This list reflects these interests. Let me start with two places that are not in Bologna but are very close and can be a great for a half day trip: Marzabotto and Dozza. (1) Marzabotto is a small town, to the south of Bologna, at the foothills of Apennine mountains. Marzabotto is a stop on the Bologna-Porretta train line and there are frequent trains from the Bologna railway station. On one of the hills called Monte Sole, not very far from Marzabotto, during the last phase of second world war, there was a massacre of civilians by German troops. Between 29 September to 5 October 1944, 770 civilians were killed including 216 children, 316 women and 142 elderly persons. You can still hear echoes of that massacre in the ruins of houses and churches on Monte Sole. However, the place I would like to suggest you to visit is the Etruscan necropolis, close to the city. 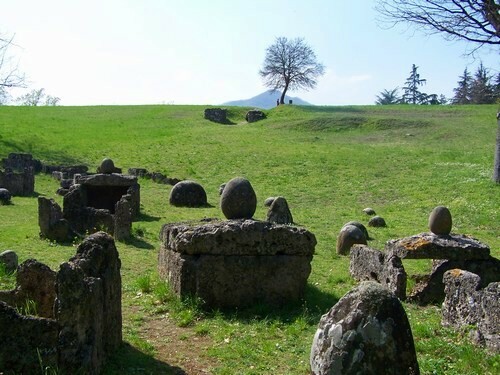 Here was one of the largest Etruscan settlement in this part of Italy and its pre-roman ruins are breath-taking including the strange tombs with round stones. Close to the necropolis, there is an Etruscan museum. (2) The second place, outside Bologna but not very far, that I would like to suggest for a half day trip is medieval town of Dozza. It is to the east of Bologna, on the road going towards the seaside towns of Rimini, Riccione and the small mountain country of San Marino. Located on a small hill with a medieval castle, surrounded by gentle hills known for their San Giovese vineyards, Dozza is like a small jewel. Some decades ago, the old city decided to reinvent itself by inviting artists from different countries to come to the city to paint or to draw murals on the houses. 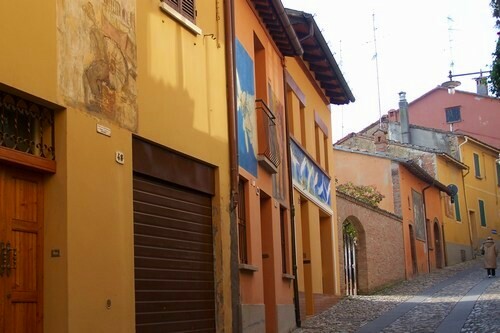 Over the years, a large number of houses in the old city present those artwork in a permanent open-air art exhibition. Walking on the cobbled streets, surrounded by colourful paintings and artwork is a wonderful experience. The basement of the medieval castle of Dozza holds the regional Enoteca, vine tasting and selling centre with the possibility of trying some of the best vines from Emilia Romagna region. To go to Dozza, you can take a bus going towards Imola from the regional bus station of Bologna, not very far from the central railway station. Now we come to my favourite places in the city. These places may be mentioned in some tourist guidebooks but usually these are not considered important. Some of them may not be there in the tourist guidebook, or at least not in the way I want you to look at them. I am going to start from the southern edge of the city and work up my way towards the north and east. Thus the order of the places I am suggesting is geographical and not because of their importance or beauty. Most of these places do not require a ticket, they are free. 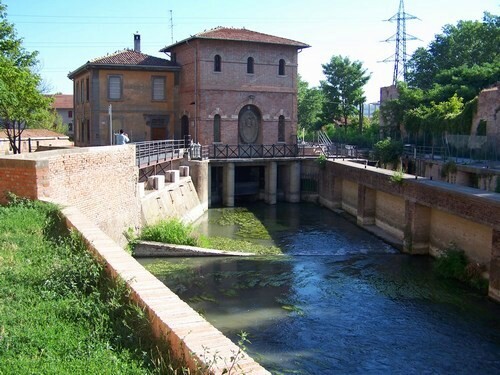 (3) Third place on my list is a hiking trip near Parco della Chiusa, a huge park and protected forest around a small dam on the river Reno located in Casalecchio di Reno, a suburb on the southern edge of Bologna. Take the road next to the church, without entering the Park and walk up. This place has bomb shelters from the second world war, when many persons from Bologna had taken refuge there. 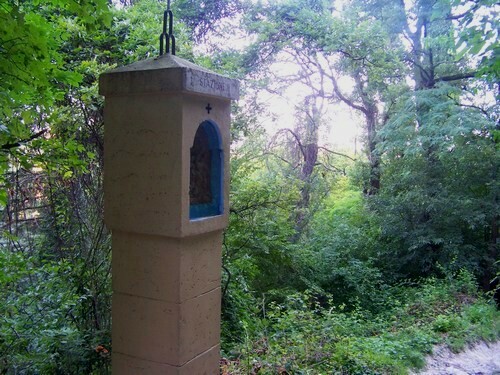 In two minutes you will find yourself in a protected forest and the first of the “cross-stations”, the small altars along the mountain track to commemorate the 12 places where Jesus had stopped before his crusifixtion. The hiking trip is for following the trail of the cross-station altars to reach the San Luca church at the top of the hill. Views from the top are beautiful and hike itself, in the middle of protected forest area is wonderful. At places the climb is a little steep, but for most parts it is fairly easy. Remember to wear sturdy shoes, take a wind-cheater or a jacket with you and do it in company, don’t do it alone. For coming down from San Luca try the stairs and the covered archway that starts from the city centre and goes up all the way to the church. To reach Parco della Chiusa, take a bus like 20 going towards Casalecchio and get down at the bus stop just after the park. (4) Fourth place on my list is the Certosa cemetery near the city stadium. The 2000 years old cemetery is built on an old Etruscan archeological site and requires at least half a day for a proper visit. It is divided into sections and is full of “monumental graves”, graves built like monuments with beautiful sculptures representing ideas and fashions of different historical periods. It is like a huge open air museum. I have been there many times, but still there are parts of the cemetery that I have not yet explored. To go to the cemetery, take any bus going towards the stadium (14, 20, 21, 89, 94) and get down at Certosa. (5) Fifth place on my list is the old port of Bologna, that goes back to the time when the city was criss-crossed with canals. After the second world war, unfortunately most of these canals have been covered for making parking places and roads. Inside the old city, there are a number of places where you can go down for an underground visit to the old canals including some Roman ruins. Usually you need to book these tours in advance and pay for them. However, the place I am suggesting is just outside the old city and here the canal comes out in open. You can start your visit from the corner between Via Minzoni and Viale Pietramellara, the circular ring road surrounding the old city. Here you can see the Salara, the salt house of the old port. It now hosts the Bologna Gay, Lesbian, Bisexual and Transgender (GLBT) centre with a wonderful library on GLBT themes and a very lively restaurant in the basement, inside the moat, venue of many cultural events in the evening. After the visit to Salara, we need to go to the old port. The ruins of the main port are close to via Gagarin. You can take bus 11A or 11B going towards Via Agucchi and get down in Via Gagarin and look for the canal. On one side of the road, next to the canal is Villa Angeletti, a beautiful park. On the other side, there are apartment buildings and an unimportant looking small track that goes along the canal. Take this unassuming track and a 5 minutes walk will bring you to a wonderful place hidden from the main road – the ruins of the old port. Behind the port, the canal is divided into two parts with a long and narrow island between the two sides. Stairs go down to the island and is a wonderful place for a walk and for bird watching. If you feel like it, you can even walk along the canal to the “chiusa”, the place where boats were lifted up for moving in the canal. You can also visit the industrial museum close by. (6) Now we start moving towards the centre of the old town and I suggest a stop at St Francis church at Piazza Malpighi. One of the earliest buildings of French gothic architecture style in Italy, it was damaged during the second world war and you can make out the repair on its façade. 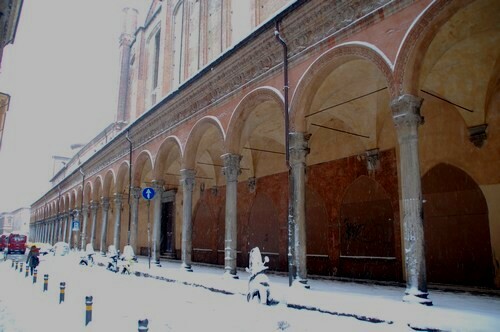 It was used as a customs house during Napoleon’s occupation of Bologna in eighteenth century. Used as a meeting place for the arts students in medieval Bologna, it is worth visiting for the graves of law teachers. 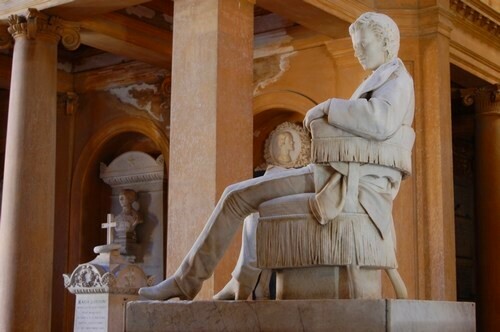 There is a wide variety of statues, lying down, busts, reading a book and many more, above the graves. There is the grave of a heretic Pope, Pope Alexander V, also known as Anti-pope. The slender bell tower is very beautiful. The cloister of St Francis church has one of my favourite engravings of a classroom scene from medieval Bologna. 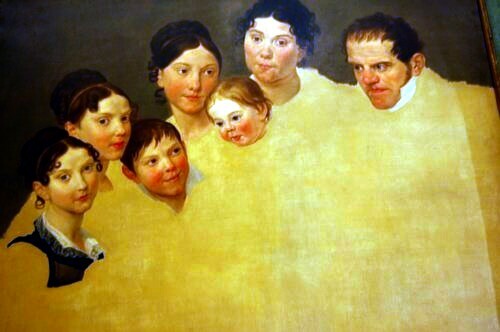 It shows that bored teachers and playful students haven’t changed after so many centuries. 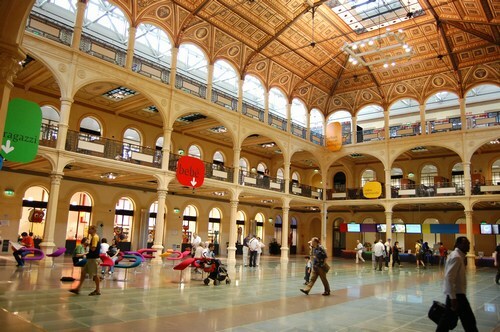 Sala Borsa now holds the central library of Bologna. Its wedding cake like balconies with a beautifully painted roof is worth a look. But even more important is to look down through its transparent floor, where you can see the old ruins from different archeological periods. (8) After Sala Borsa, enter the Palazzo d’Accursio next door and walk to the wonderful stairs at the back, that were made for horsemen to gallop up the two floors without slipping. Go the second floor for the Municiple art collection of Bologna. The second floor main hall is wonderful with its frescoes in different shades of browns. Take a look at medieval frescoes in the Sala Farnese and you will feel like standing there and gazing at them endlessly. (If you have problems in climbing the two floors, you can look for the elevator). However, don’t get lost with Sala Farnese, remember to go to the Municiple art collection (you will have to collect a free ticket). If you don’t have the time to go through all the collection, ask one of the volunteers there to guide you to the Pelagio Pelagi collection. This rich nobleman of Bologna has left his art and sculpture collections to the city and a key part of his collection are his own works. I love his paintings and I think that he merited more appreciation. Probably he was dismissed for being a “rich art lover” and never got his due as an artist. (9) After you are done with admiring the square and the cathedral, I suggest that you move to Santa Maria della Vita church on Via Clavature, 5 minutes walk away from the square. This church was part of the oldest hospital in Bologna and you have time, you can take a look at the old hospital museum next door. But don’t miss the “ugly Marias” of Bologna inside the church, in a side room, that can be reached by small stairs next to the altar. 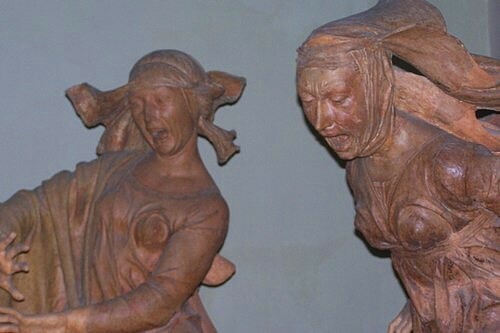 These are a set of terracotta figures made by Niccolò dell’Arca showing the dead Christ and the grieving Marias (Mary, Christ’s mother and Mary Magdalena), their mouths open in a silent scream. They are incredibly moving, though Bologna men are known for calling any ugly looking women as “like the ugly Marias of Bologna”. (10) The next on my list is the small St. Cecilia chapel on Via Zamboni, 10 minutes walk from Via Clavature. You will see the faded frescoes on the outside wall of St. Cecilia church and underneath the archway, desperate looking signboards asking you to visit the chapel. For once, it is not a ploy to lure unsuspecting tourists to some mediocre sightseeing visit. The chapel is worth a visit and it is a pity that it is so little known. If you follow the signs and go through the side entrance, you will find yourself in a passageway with a small door pointing towards the chapel. The shock when you enter the chapel after such unassuming entrance is worth the visit. The bright coloured frescoes covering all the walls are like a hallucination. It is a small chapel and yet the quantity of images and colours it contains is very impressive. (11) Now we move to my last stop for this Bologna trip. This is another climbing trip. 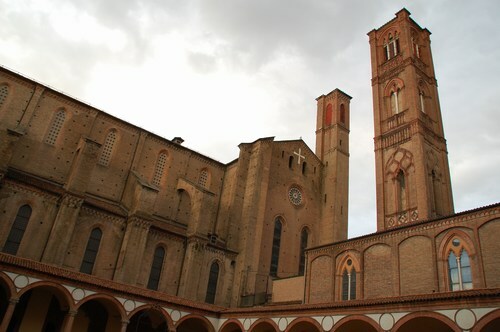 Walk back to the twin towers in the centre of Bologna and enter the tower of Assinelli. There is a three Euro ticket and the climb up the narrow winding stairs is tiring. Every now and then, depending upon the state of your lungs and body weight, you will need to stop, catch your breath and look out of narrow windows at the panorama of Bologna. But the view from the top is really great, it is literally breath-taking, and it makes you understand why Bologna was called the city of towers. Most of the towers are gone now, but still hidden among the buildings, there are enough of them to justify this name. 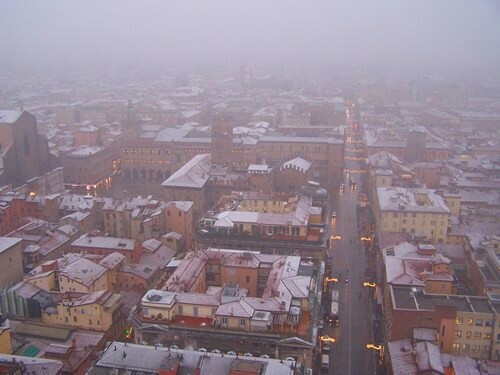 If you are in Bologna on a snowy winter day, the view from the top becomes even better with snow covering the roof gardens of old city. There are many more places that I love in Bologna. When I had started to write this post, I was thinking of mentioning seven best places, but I just couldn’t decide which ones to leave out. However, I can easily add another 11 places, and I am sure that there are many more things to do in Bologna, that I still need to discover. If you do come to Bologna and this post is useful in some way, please do remember to tell me about it. You can also download a PDF version (without images) of this post for printing and carrying with you to Bologna.